2nd july 2007. Line 54 is no more... a single line that rides from one part to the other part of the Brussels Region, between Machelen and Forest Centre! 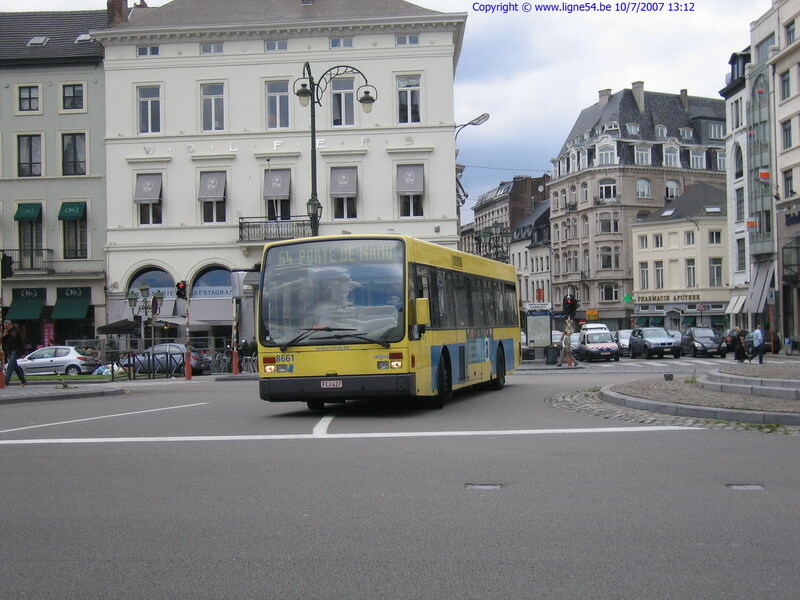 At this date, line 54 rides practically on the original trolleybus route from the 18th april 1939 between the centre of Forest and the Place du Luxembourg, with some differences : the service of the Town House of Forest, of Ma Campagne and of the Porte de Namur. The extended route between Luxemburg and Machelen, opened on 30th May 1939, is now a part of the new line 64 : Porte de Namur - Machelen. The road of brussels' line 54 had not so much changed since feburary 14th of 1964. Mostly was it adapted with the changes of the city and with new traffic situations. 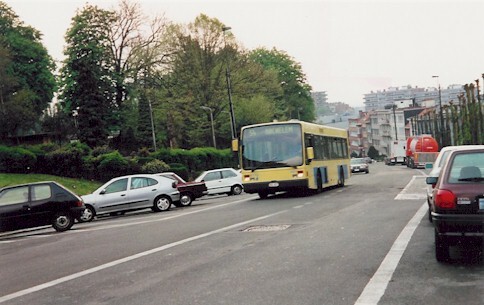 Brussels' line 54 in the times after the trolleybus : bus Van Hool Man A300 8770 arrives on the top of Avenue Victor Rousseau, near the Parc Duden. You can compare this picture with the one at chapter 'the history of the Brussels' trolleybus service', where a trolleybus arrives too at the top of the same street, about 60 years before. The service had a fundamental change too when the buses came : service was opened in the evening between Machelen and place du Luxembourg, the limitation on sundays at the same place (till Porte de Namur around 1990), who evolved with the times (service was intensified in the rush hours, new service on sundays till Forest, first with a large frequence, then one bus every 30 min. and today every 20 min., limitation extended to De Cortenbach in september 2003. Limitation at Porte de Namur was withdrawn in september 2004 and service was limited after 11 p.m. at Cortenbach at the same date). 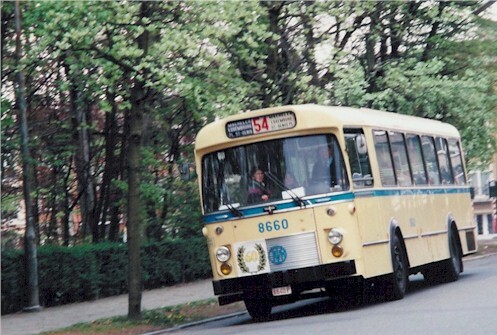 The Brossel AB6DS of the times of the trolleybus included, a great number of different bus types rode on the 54, from Brossel A99 DAR to Jonckheere SB250. 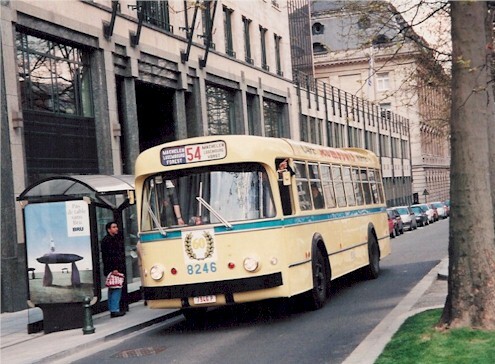 All buses of this line were based in practically all the bus garages of the Brussels' transport society, from Rue Brogniez garage to Haren, over rue du Frontispice and garage Delta. 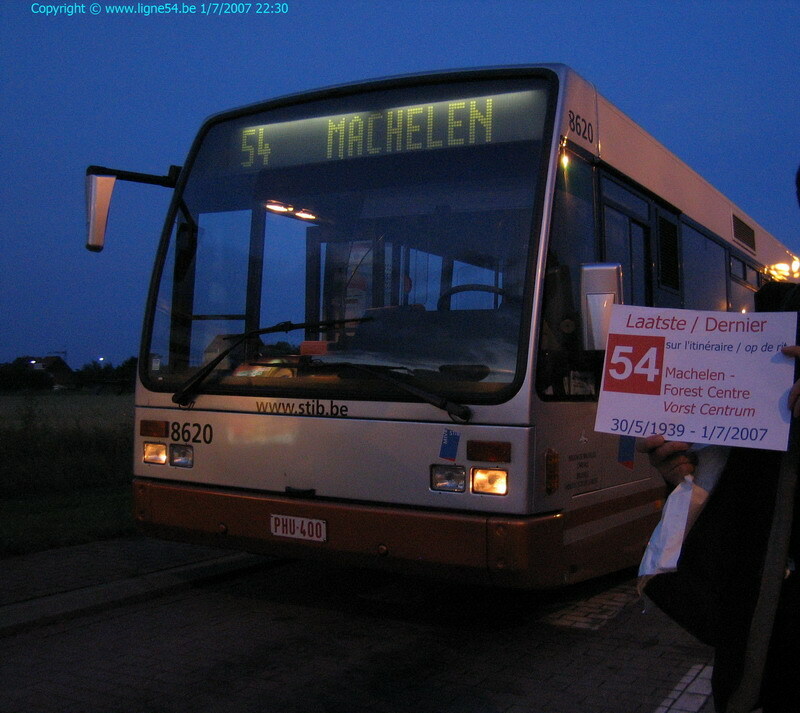 Between the 11th december 2001 and the 2nd July 2007 was line 54 the longest STIB/MIVB bus line, with 18,9 kilometers. From the trolleybus times, a few relics are still present in the landscape. 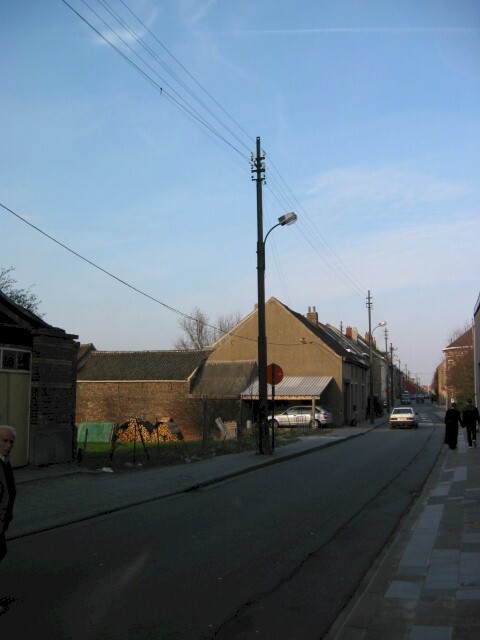 The most evident traces are the street lamps in Avenue Victor Rousseau in Forest, that were the supports for the trolley wires. The lightning equipment of the Rue de Verdun in Haren has the trolleybus line as origin too. 1. 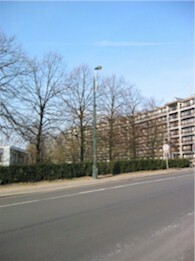 A street lamp of Avenue Victor Rousseau, former support for the trolleybus' trolley wires. On the base of this support can we still find the old logo of the Tramways Bruxellois. Line 54 was an inevitable line of the Brussels' net. With this line some different kind of places were connected (different residential or popular quarters, a village outside the Brussels region, commercial quarters (Forest, rue du Bailli, chaussée d'Ixelles, place Dailly, place de la Paix), went through the european quarter and different industrial sites (Forest, Haren nord, Machelen industrial zone). Now, lines 54 and 64 have the same function on their respective lines. You can see a complete overview of these lines under the following link (only in french and in dutch) : http://www.ligne54.be/schema54.html. The future of the line : both lines are considerated as strong lines of the net, and a particular attention to the service will be brought to these lines. For a long time in service on the line, all kinds of Van Hool Fiat or Leyland of this form have ride on line 54. Here we can see the Van Hool Fiat 5 8660, avenue Chazal, 17 april 1999, during the celebration of the 60th anniversary of the line.